A Moscow–Sochi news conference by the Sochi 2014 Organizing Committee. RIA Novosti Group has performed all its obligations as Host National News Agency and National Olympic Photo Pool for the Sochi 2014 Olympic Winter Games by covering the Sochi 2014 Paralympic Winter Games. Slovakia's wheelchair curling team surprisingly stormed to the top of the Sochi Paralympics round robin table on the second day of the competition Sunday. The Sochi Paralympics will bring about wide-ranging change to the way Russians see disabled people, International Paralympic Committee president Philip Craven said. Russian Prime Minister Dmitry Medvedev on Thursday handed out the keys to a fleet of brand new Mercedes as prizes for the country's Olympic medalists at the Sochi Winter Games. 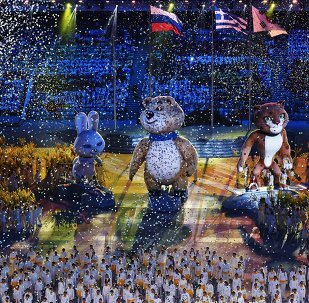 The RIA Novosti media holding has successfully performed its role as the host national news agency and photo pool of the Sochi 2014 Olympic Winter Games, the closing ceremony for which was held on February 23. From February 7-23, Sochi hosted the XXII Winter Olympic Games. The Russian national team placed first with 33 medals, including 13 gold medals. This RIA Novosti infographics provides additional Olympic statistics. What do you get when you cross 3,000 of the world’s fittest athletes in a strange city with free alcohol and smartphones? Evidently, a lot of people revved up on hormones looking for ways to link up with fun-loving new friends. On Sunday February 23, the Winter Olympics came to a close in Sochi. This image gallery features the most beautiful shots taken at the Games. World, Olympic and other records and achievements at the Sochi Winter Games. As throngs of Olympic tourists dragging heavy suitcases rushed to airports and train stations on Monday, Sochi reassumed its role of a small resort city glistening by the sea - a bit bedraggled, but bursting with pride over its handling of the Winter Games. The Russian national team set a national record for the total number of medals it won as well as in the number of gold medals. The team won 13 gold, 11 silver and nine bronze medals. The closing ceremony of the XXII Olympic Winter Games was held on Sunday at the Fisht Stadium in Sochi and presented Russian culture as an inseparable part of the world’s cultural heritage. The Russian national team set a national record for the total number of medals it won as well as in the number of gold medals. The team won 13 gold, 11 silver and nine bronze medals at the Sochi Olympics. As the 22nd Winter Olympic Games came to a close on Sunday, one shocking realization set in. Sochi had just served up a textbook Games. International Olympic Committee president Thomas Bach closed the 22nd Olympic Winter Games on Sunday after a spectacular closing ceremony that rounded off 15 days of sporting action on the Black Sea coast. At an Olympics designed to advertise Russia’s resurgence on the world stage, the host nation’s athletes played their part masterfully. Medal events of the 2014 Winter Olympic Games ended in Sochi on February. Here’s an image gallery of the closing ceremony at the Fisht stadium.